Dusty Hawkins and Rebecca Greenberg are the first winners of the University of Alabama Outstanding Research Competition. From the January 2017 Desktop News | Two students in the Department of Geological Sciences recently received $5,000 by winning the first University of Alabama Outstanding Research Competition. The competition funds theses and dissertations that perform cutting-edge research related to the assessment and treatment of chemical contaminants in soil and groundwater. The competition was created by Geosyntec Consultants, an engineering firm that works with clients to address new ventures and complex problems involving the environment, natural resources, and civil infrastructure. “Geosyntec is interested in identifying and rewarding students who are conducting innovative research in the environmental field,” said William Burke, a UA alumnus and geologist at Geosyntec. “The two winners of the UA Outstanding Research Competition are conducting research in emerging contaminants and acid mine drainage, both of which are big problems, not only in Alabama, but worldwide. 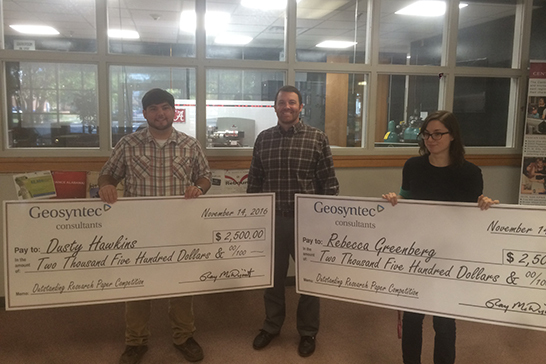 Graduate student Dusty Hawkins and doctoral student Rebecca Greenberg are the first winners of the competition. Each received $2,500 to support research. A portion of their winnings will be allotted to their respective research programs within the Department of Geological Sciences. According to Dr. Geoffrey Tick, associate professor of geology, Geosyntec has been recruiting at the University since 2012, and five graduates have been employed at the firm.